Want to get better at strategy analysis so going to try to do one of these a week for a while. Figured I'd start with a 100 Thieves game since we just bought them. Also Hauntzer vs Ssumday is a powerhouse top lane matchup! First Bans - Nothing too crazy. 100 Thieves targets Bjergsen's pool with Azir/Galio, and takes away Hauntzer's Camille. TSM likes these champs that can hold people in place for key abilities. Think Camille ultimate into Gallio ultimate with Azir Shurima-shuffling champs into that wombo. TSM takes away Ryu's Ryze (he's been playing really well on it), Zoe's just annoying to play against with the long range cc + poke. Not sure what the Corki ban is from? Haven't seen Ryu or Cody Sun play that champ yet. Might be showing that TSM wants something like a Kassadin and doesn't want to get bullied in lane by a ranged champ early? First Picks - 100T locks in Kog'maw for ADC first pick. High priority pick since this champ is arguably the best ADC right now, and does WAY too much damage with 2+ items. Kog'maw means 100T want a long game and lots of farming early. TSM counters with Sejuani (probably jungle) and Taliyah (probably mid). Champs with pick and burst potential to isolate and quickly kill a fed Kog'maw. This leaves champs like Lulu or Karma up which Kog'Maw loves for the shields/sustain/crowd-control and extra stats from their support itemization. Second Picks - 100T locks in Jarvan IV in the jungle and Alistar in the support role. They have a good frontline for Kog'Maw that can make picks or and control the area around Kog'Maw. Alistar pick is a melee champ and they may be trying to limit the melee support pool of TSM since you usually want 2-3 melee champs to stack her Permafrost stun. No shields for Kog'Maw, which is interesting, but maybe they run something like Lulu mid/top? TSM locks in Gangplank (probably top). Melee champ for Sejuani, and another damage threat. Both Kog'Maw and Gangplank have late game power spikes after a lot of farm, so TSM probably trying to equal damage curves. If Jarvan IV ults a target, Gangplank can drop his ultimate on the same area to stop 100T from following up. This will also pull Meteos's J4 top early/mid game to stop Gangplank from farming, leaving Kog'Maw susceptible to early dives bot. Second Bans - TSM still has to pick their botlane, so 100T uses their bans to target those picks. Braum is one of the best supports to play with Sejuani (melee + extra crowd control), and Tristana can jump out of Jarvan IV ult with her E, and can make picks with her Ult potentially repositioning Kog'Maw into unfavorable territory. Smart bans. 100T is yet to pick their solo lanes. Looks like TSM target bans Ssumday's ranged top laners so that he'll have a hard time bullying Gangplank in lane and stopping him from farming. The Gnar ban is especially smart since it denies 100T the Gnarvan combo (J4 ultimate into Gnar ultimate AOE stun). Third Picks - TSM locks in Ornn for support. Melee champ that synergizes well with Sejuani's stun passive, and has abilities that elongate crowd control durations. Also, Braum is banned, which is usually a good Ornn counter (Ornn ults, Braum uses his shield to block/cancel the initial Ornn Ram). Granted 100T has already locked Alistar, but still! 100T locks in Twisted Fate (probably mid) and Vladmir (probably top). They are heavy on the magic damage (Kog'Maw does a lot of magic damage for an ADC), and don't have a good front line for keeping Kog'Maw safe. Aphromoo's Alistar is going to have to put in some WORK to keep his carry safe. 100T is probably opting for a 1 3 1 type comp, with Vladimir and Twisted Fate split pushing. Vlad can join fights with Teleport, TF can use his ultimate to join fights or make picks off of bad rotations. Vladimir can sustain through Gangplank's harass and can use his pool to dodge a lot of scary abilities (Sejuani/Ornn stuns). Vladmir's ultimate will also amp Kog'Maw's damage in team fights if they can hit the same targets. Final Pick - TSM locks Varus for ADC. Their team comp is looking to initiate with Orrn Ultimate, into Varus ultimate, into Sejuani crowd control, with a Gangplank ultimate and Taliyah damage on top of everything. They have pick potential with all champs (Gangplank can always just press R to help) and can deal with split pushes or a 5v5. I really like TSM's comp and think they're better off. 100T is looking to 1 3 1 and catch TSM in bad rotations to take objectives. Once Kog'Maw gets a few items, they may look to team fight, but TSM's 5v5 is better and should be able to zone Kog'Maw out from doing damage. 100T is looking to get strong early (probably through midlane) and roam to take early towers with TF, opening up the map for their split push. This doesn't give Kog'Maw time to farm safely, but TSM's team comp is just better, so they're looking to end quickly. Start - Things to notice! TSM taking teleport and cleanse on their solo lanes vs 100T 2x ignites. 100T wants to win early! Botlane both supports have ignite. This is going to be an aggressive early game! Both teams fan out and guard their respective jungle entrances. No cheesy 5man invades, or risks for deep vision. Laning is where the aggression will come out. TSM knows they win if the game stalls out, so the impetus is on 100T to make something happen. Jungle Starts - Both 100T and TSM start their bottom buff. Notice that they're not doing wolves or raptors for the extra experience (kill big monster, leave littles, clear after another big monster is cleared for 50 extra exp). This means both junglers are looking to hit level 3 fast, and looking to control top/mid. J4 is much stronger early game compared to Sejuani, and can do cheesy things like ganking level 2 with red buff mid/bot lane for some unexpected aggression. Sejuani is looking to farm and get level 6 (when she becomes stronger than J4), and match or counter gank until then. 3:25 - Not a fan of Meteos's clear pattern. He doesn't use his powerspike at level 2, or 3. And is behind Sejuani by a camp and lacking control (look at the scuttles and wards on the bottom half of the jungle). Gangplank's lane is ungankable and he is able to farm (what he wants to do), and botlane is perfect for Kog'Maw farming. Looks like Meteos is content to powerfarm jungle and wait for TF to hit 6 for ganks? One thing that's nice is that TSM doesn't have a good idea where Meteos is on the map due to his weird clear and not being spotted out by wards. But again, this strategy isn't the greatest since TSM's comp will outscale 100T, so doesn't fit the "win early" strategy. 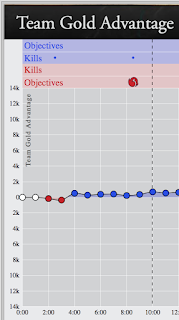 No aggression yet, TSM with slight creep score advantages in every lane + jungle. 3:53 - AYYYYYY I was wrong! Very clean play by Aphromoo to setup first blood and blow Varus Heal. 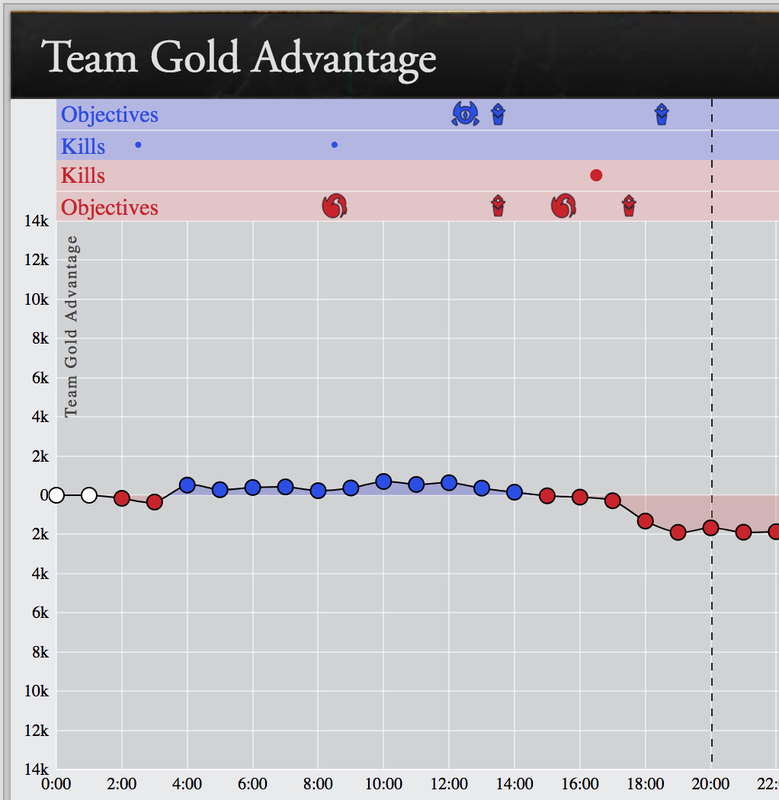 Surprised that worked, but TSM did not respect the engage. Alistar can cancel his knock up animation with flash, so you pretty much need to predict that engage to dodge on champs with no crowd control or dodges to interrupt. Notice that Kog'Maw used his heal offensively to speed up both Alistar and himself. Think this was overkill and unnecessary, but still, nice kill, good gank, and gold onto Kog'Maw plus the extra waves of creeps to farm! 5:43 - Twisted Fate hits 6. This is when 100T's team comp should start making plays across the map. Expect Ryu to shove waves and roam to side lanes with his ults. At 6mins, the stopwatch rune activates and everyone but Sejuani gets a free Zhonya's active. So dives will be tricky. That rune can be used offensively to juggle tower aggro, or defensively to deny dives or that last tick of ignite. Notice the double control wards on the bottom side of the map. They know TF wants to roam bot and are putting those there to spot him out! TSM is ahead in gold for all lanes except botlane. So time for 100T to start making plays before they get outscaled. 9:23 - Nothing happens for a while. No ganks, no roams with TF ultimate, just farming. TSM makes a good play on the Ocean dragon when the 100T botlane backs. Mike Yeung blows Kog'Maw flash with Sejuani ultimate, but then gets picked off by an Alistar/J4/TF wombo when overextended trying to clear a ward. Nothing in the area objectivewise for 100T to capitalize on. 100T are up a slight amount of gold from the early kills bot. 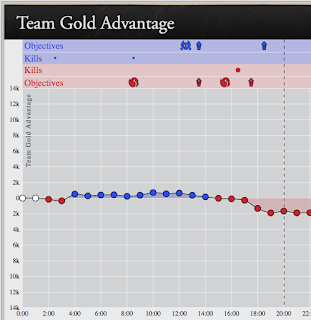 Farming continues, which again, is what TSM wants since their team composition is better. Interesting that TSM did not go for ganks mid against TF. Usually champs with no dash or escape are an easy burst combo for Taliyah. Maybe a missed opportunity to gank the global? 13:57 - Good wards on the TSM blue jungle reveal Sejuani backing, which lets J4 pick up a free Rift Herald. He's seen from a river ward, but TF uses ultimate to scare off enemy team, and Ssumday teleports in (spellbook rune changed from ignite) for extra muscle to scare off Sejuani's steal attempt. 15:25 - Four man roam bot scares away Alistar/Kog'Maw, allowing TSM to pick up the first cement bonus from killing the first tower of the game. Meteos sees this happening and summons the rift herald top to counter with a tower and a half worth of damage. Hauntzer's Gangplank backs off respecting Vlad+J4's kill potential. TSM has 100T's red jungle lit up with wards, and is likely looking to control the 2nd Ocean dragon after everyone recalls to spend their gold. 16:47 - TSM's vision control pays off and they're reward with an uncontested Ocean dragon (their second of the game). All TSM carries are happy they can spam abilities on cooldown. A Mountain Dragon is spawning next in 7mins. Both teams will likely prioritize this objective. 17:47 - Ryu's TF makes a nice pick on Zven's Varus bot, blowing both Varus summoner spells. Ssumday makes a rare mechanical error flashing after Varus (Didn't lead with his ult), and dies to the remaining members of TSM collapsing around him. This is a mistake from 100T who need to take the blown summoners and back off instead of forcing things (but the playmaking is understandable since they're up against the clock to end the game early). Cody Sum's Kog'Maw overextends toplane and is picked off by the Hantzer's Gangplank, blowing Kog'Maw stopwatch and heal. Both teams making some positional mistakes. 20:00 - Nothing fancy happens. Remaining side lane outer towers are traded. J4 burns Gangplank's flash with his ultimate. 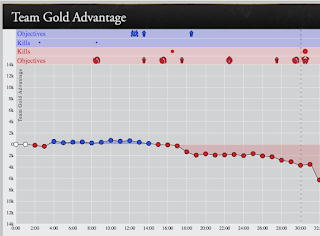 Gold is in TSM's favor by ~1k plus the 2x Ocean Dragons. TSM is itemizing heavily into magic resist items, and is in a good place, scaling into their superior team comp mid-late game. 100T begins their 1 3 1 with Vladmir and TF in the sidelanes, matched by Taliyah and Gangplank respectively. Really like those TSM picks since Taliyah can use her ultimate to follow TF, and Gangplank can click R to help if his teammates get engaged on. Hauntzer probably could have itemized into an executioner's calling (800g item) for the grevious wounds passive to negate Vladmir's sustain. Instead he opted to finish core items and farm waves back and forth with Ssumday (who just heals off any chip damage). Both teams have vision around Baron Nashor. TSM will likely wait until the Earth Dragon spawns, and force 100T to choose between objectives. Both teams have global ultimates, teleports, and can move across the map very quickly. 24:07 - TSM controls the dragon pit, and secures the Earth Dragon as 100T watches helplessly. Next Dragon will be a 3rd Ocean. TSM's team composition is starting to look far superior and 100T can't engage 5v5 without suffering heavy casualties. Hard for 100T to split since TSM's champs can easily match the pressure, and still contribute in team fights with global ultimates. Next objective is likely Baron or mid outer tower for TSM who is in complete control. 100T is looking for TSM to make a positional mistake, and pick someone off, or get an AMAZING team fight where Kog'Maw survives long enough to kill everyone on TSM. Which will be tough with their team comp. 26:17 - Here's an example of the team comp difference. TSM executes this very well. 100T cannot win a sustained all in, and must rely on picking off members of TSM that aren't grouped. 100T is now down a teleport, which TSM can abuse to gain control over the Baron pit. 28:00 - TSM patiently and methodically pushes down the 100T mid outer turret. Here the 2x Ocean Dragons are starting to really hurt 100T. TSM can continue trading, and then regain health and mana after a few seconds, while 100T are slowly getting whittle down. Sejuani continues to fish for Kog'Maw with her ult, looking to blow summoner spells or his QSS. TSM is building this pressure while their top wave crashes into the 100T inner tower. A 100T botlane wave is slow pushing which will need to be cleared by TSM in a minute or two (worst case Gangplank can always use his ultimate on it). The Baron dance is about to begin, with TSM in a superior position. 30:18 - 100T blows Varus flash, and then looks to bait a fight at Baron. 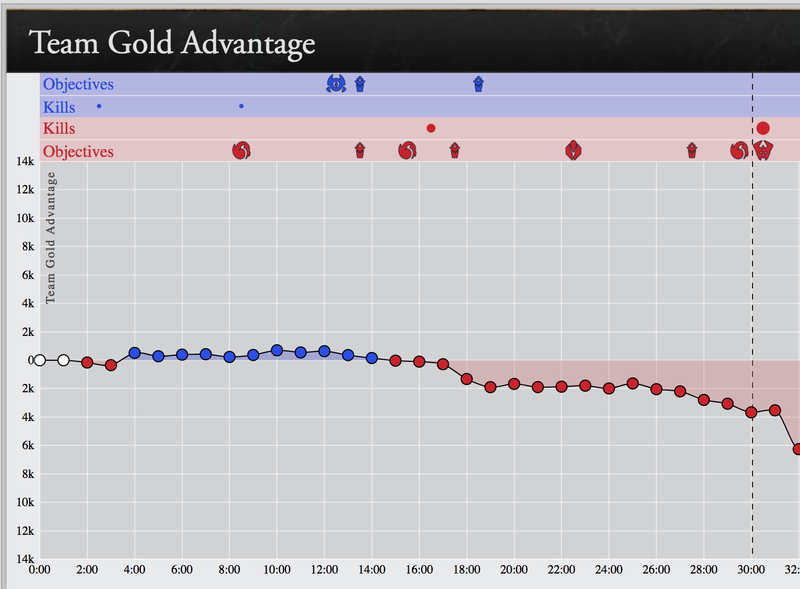 They are down 3.7k gold, 4 dragons, and their team composition is far inferior to TSM. 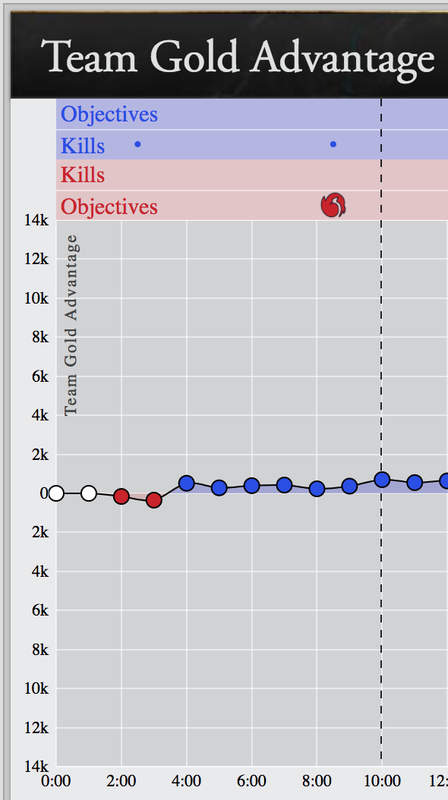 They're looking to get Baron and force a powerplay before TSM completely outscales them. Remember, TSM has Ornn items as well, so they WILL be stronger if the game goes full builds. Meteos throws the game at ~31mins. Not sure what he was looking to do with the engage minus follow up from Kog'Maw and Ssumday putting pressure bot. Wasn't looking good for 100T anyway, but this did not help. 34:22 - TSM is in complete control and takes two towers, an inhibitor, and the two nexus towers after Meteos gets caught out of position. Ryu takes the TSM outer mid tower as a parting gift, and Kog'Maw is able to get a few kills, but now it is only a matter of time before 100T loses. TSM can wait for super minions to build pressure bottom, and control the Elder Dragon with their 4-0 Dragon lead, then end the game with one final push. 35:52 - TSM sets up for the Elder Dragon. Notice their top wave. It is setup to slow push and build pressure exactly when the Elder Dragon spawns. That pressure, plus the super minions pushing in the bottom lane, should allow TSM to ward up the 100T Red jungle, and control the Elder Dragon. Very well played by TSM. 38:29 - TSM controls the Elder Dragon and heads to Baron. Good patience by TSM to wait for an engage until the big wave top was taking an outer turret. This spread 100T too thin, and allowed for a TSM pick and control of the Elder Dragon. Now an easy rotation to Baron, and end the game from the bot lane for TSM. 41:05 - GGWP TSM wins. What could 100 Thieves done better? 1. They got severely outdrafted. This is the main reason 100T lost. Kog'Maw is a huge powerpick, but needs a frontline or shielding supports to allow him to do the damage. 100T had J4 and Alistar to frontline, but TSM had too much crowd control and zoning abilities for Kog'Maw to get close enough to do damage before his frontline melted. TSM had answers to the 100T 1 3 1 split push comp, and a better 5v5 teamfight. Plus, 100T was mostly magic damage with a tank Jarvan IV out of the jungle. Made it easy for TSM to itemize magic resist items to make team fights and picks tougher to pull off. Ugly draft for 100T, very well played by TSM! Ssumday could have played something with more damage top to put more pressure on the Gangplank, but TSM banned his two practiced damage dealers. Vladimir auto pushes the lane with his area of effect abilities, so easy for Gangplank to farm safely under tower making it tough for Meteos to make plays. 3. Meteos needs to stop doing bad engages late game. This is a bad habit that repeats itself in most 100T games. Meteos will engage without his team, or without waiting for waves to create enough pressure. He's been lucky a few times where his team has still gotten the W, but it completely threw the game to TSM in this game. 4. Better Dragon Control. Giving up the early dragons for free, made TSM's carries and siege a nightmare to deal with later. It also made Elder Dragon an extremely important objective since TSM was able to stack 4 Dragons early. 5. Better wave management. 100T could have used minion wave mechanics to create pressure and force TSM to split up, giving them an advantage. Granted Gangplank or Taliyah can both use their ultimates to get back into the team fight when they go to fix the waves. Again, the draft was brutal for 100T, if they fix that, a lot of these problems go away. This was a fun game to watch and I've enjoyed watching 100T get better. Fun watching a new team hold their own against these legacy power houses. Still very early in the season and a lot of time to improve and fix mistakes! Let me know if this is interesting on Twitter or Twitch! Will try to do more of these if people are into them. Thanks for reading!